Furthermore, Matthew’s Gospel is most concerned with the problem of the relationship to the Law and tradition and, much to Pasolini’s liking, suggests an ambivalent attitude towards both. Any reader of Matthew’s text is bound to be struck by the recurrence of the formula, “You have heard that it was said . . . but I tell you . . .” Tradition is invoked and corrected, accepted and refused. As a result, Matthew’s Christ is the embodiment of a destructive reverence, of an oxymoronic love/hate relationship with the Law. 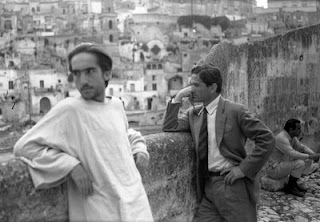 Such a gesture of simultaneous affirmation/negation is cleverly emphasized by a recurrent image in Pasolini’s film: Christ’s most often-repeated posture shows him walking decisely ahead, with his back to the camera and his face turned towards it. An image which stresses leadership but also conveys the sense of going ahead while looking back. From the point of view of literary symbolism there being twelve disciples works very well, serving to draw parallels with both the twelve sons of Jacob, and the resultant (if slightly different) twelve tribes of Israel. 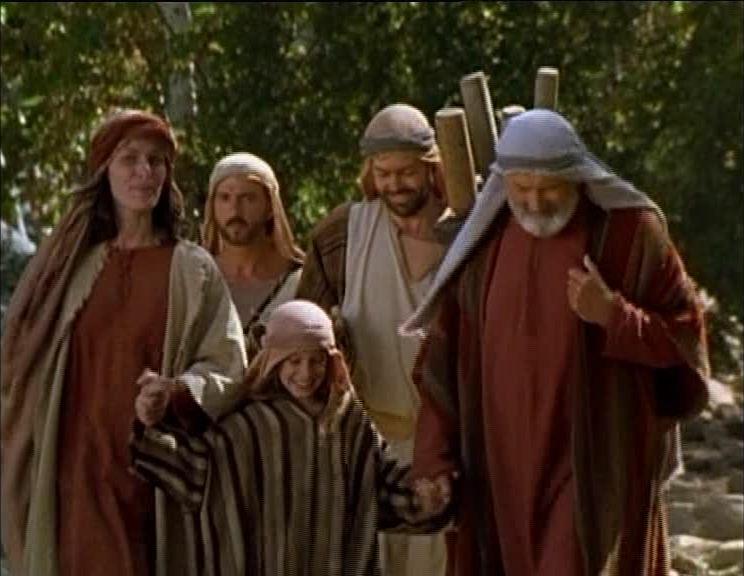 But from a cinematic point of view, it's somewhat awkward as it's difficult to flesh out all twelve disciple as well as Jesus, his opponents, some of the other minor gospel characters, not to mention any fictional characters a screenwriter might also wish to include. It's true, of course, that even in the gospels some of the disciples are covered in more depth than the others, but a screenwriter also has to contend with a limited amount of time in which to cover them. The result is that the majority of Jesus films only portray a few of the disciples in any kind of depth. Peter, John and Judas feature in almost every film in some capacity, and both have starred as eponymous leads in their own right during the last 10 years. Most of the others appear in their own right in one film or another, and are usually present for key scenes such as the Last Supper. Yet, when it comes to the less prominent disciples, surprisingly few films create significant back-stories for them or supplement the relevant parts of the Bible with fictional material. In the remaining posts in this series I'm going to have a brief look at each of the disciples in turn and discuss their portrayal in films about Jesus, though, as I noted when I compared the different gospels' lists of the disciples, distinguishing them might prove to be something of a challenge. 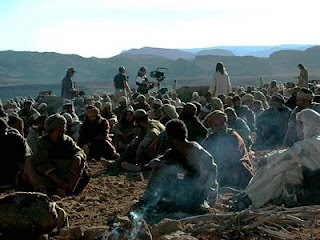 The Mark of God: Is Visual Bible's Gospel of Mark Film in Production? EDIT: Sadly it appears that I have been too hasty with this post. I've subsequently heard from François Perrier that the production was never finished, and Clayton Slaughter has heard the same from Kevin Sage. So it looks like this was a red herring. Apologies. Ever since the 2003 release of Gospel of John there have been rumours about a word for word adaptation of Mark's Gospel. These surfaced most recently (to my ears) back in January when an email purportedly from Philip Saville (director of Gospel of John) was posted on YouTube with the throw-away comment "Maybe next year?" This was an amazing day, because we had 1000 people (extras) around us. This is the scene where Jesus (Kevin Sage) fed all the people with only 3 fishes and 3 breads. There's also another image of F. Murray Abraham sat in a reconstruction of the Roman senate. Now it's possible that there are many actors named Kevin Sage, but this one lists a principal role as Jesus, made for "Visual Entertainment" on his CV in a film called The Mark of God. And if you look at some of his photos it includes a number of pictures from The Mark of God with Sage playing Jesus, including ones with him next to F. Murray Abraham, showing the holes in his wrists (note wrists -his palms aren't visible), at the last supper and preparing to wash the disciples feet. The photos note that these were shot in Morocco (where else? I really need to get a contact at Atlas Studios). It seems to me, then, that there are two possibilities here. One is that The Mark of God is the long awaited adaptation of Mark's Gospel. The title is a little ambiguous though because whilst it does include "Mark" in the title, it doesn't explicitly call itself Mark or The Gospel of Mark. The Sword of Peter tells the story of the Galilean fisherman who founded the Christian church in Rome. 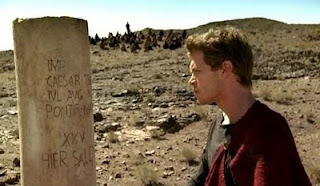 The film explores the early days of Christianity under the reign of Emperor Nero and the burning of Rome in 64 A.D.
That would explain what F. Murray Abraham is doing in the senate, and presumably the use of Mark's name is just a nod to the ancient tradition that he was Peter's translator. But then what about the repeated mention of the Visual Bible name? Hopefully more will become apparent in the near future. Alex von Tunzelmann on Radio 4's "Any Questions?" I've been a regular listener to BBC Radio 4's 'Any Questions' show for several years now, and, what with iPlayer, it's rare that I ever miss an episode these days. But I was particularly pleased to hear that Alex von Tunzelmann the historian who writes the Guardian's weekly Reel History column was going to be a guest on last Friday's show. I've only managed to listen to the start of it so far, but I thought anyone else who follows von Tunzelmann's work with interest might be interested to know. I'm never sure how much of iPlayer is available overseas, but for those of you who do have access to it (which may include people who don't normally get a lot of the BBC's output on iPlayer) you can listen to the programme here. I was sorry to hear about the death of musician and actor Michael Been at he age of 60. Been was best known as the vocalist/bassist in The Call, whom I first discovered at my very first Greenbelt festival back in 1989. They weren't actually present, but their song "Let the Day Begin" was played continually by the Rolling Magazine tent and could be heard all over site. When we got back it was record of the week on Simon Mayo's breakfast show, and I bought a great big 12" version. The following year at Greenbelt I was one of maybe 10,000 who watched them play on the main stage. But it's another Greenbelt memory, from 1992, that makes this sad story relevant to this blog. That's when, in the midst of an almighty rain shower I lay in my tent reading an interview with Been from (I think) Third Way Magazine. 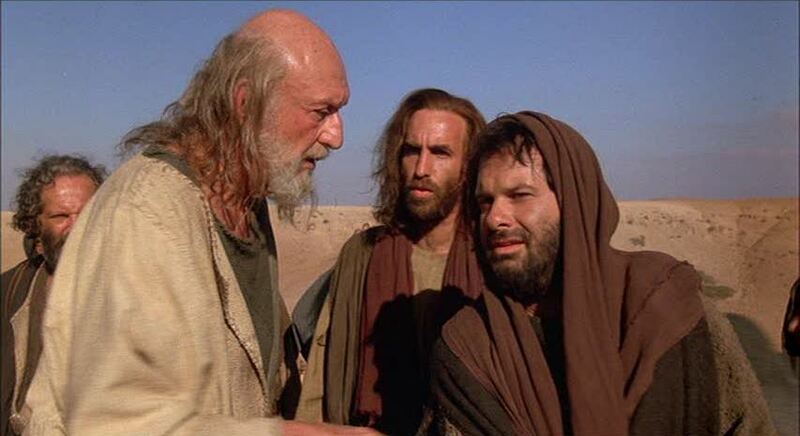 In it he talked about his role as John son of Zebedee in Last Temptation of Christ (pictured right). It was the first time I had heard someone express something positive, rather than merely defensive, about the film. I don't think I have the article any more, but Been talked about how he liked the way the film portrayed the human side of Jesus. Been's role is small but packs a lot in as he switches from part of the yelling mob at the attempted stoning of Magdalene to one of Jesus' followers. A sad loss. Doug Chaplin links to a sketch from last week's The Mitchell and Webb Look about the moon landing conspiracy theory. This week, not only did they send up the Princess Diana conspiracy theory, but they also included a brief sketch called The Passive-Aggression of the Christ. As far as I can make out, it's not yet been copied onto YouTube, but the whole episode is still available on iPlayer. The sketch is about 14 minutes in. That said, the title is probably the funniest thing about it. Overall the series has been rather hit and miss. As with previous series some real gems - not least when they take on religion - but they need to learn when to kill off repeating sketches. The post apocalyptic quiz was wearing thin last series, but has continued in each episode this series as well. However, this is probably a good moment for me to link to M&W's takes on the Good Samaritan and Abraham as well. Every so often I feel I have to sit down and work out a passage from the four gospels that I've never quite been able to get my head around. The problem, I think, goes back to my childhood. I gradually became aware of differences in certain accounts but, lacked knowledge about how to handle such discrepancies. So I was left trying to harmonise them into a single coherent picture. I gave up that approach a while ago and since I stopped trying to square a circular peg to put it in a square hole* I find it easier to look at these passages and grasp what's going on. (Here's another I did back in 2007 on the woman who anointed Jesus). I'm planning to write a few short posts on depictions of some of the disciples in the various films, but the names of the disciples is one such tricky case. As you might expect, the synoptic gospels are fairly similar(Matt 10:2-4, Mark 3:16-19, Luke 6:14-16), and Luke's list is repeated in Acts 1:13. They all name Simon (who is called Peter), his brother Andrew, James and John, though Mark puts Andrew 4th (not 2nd as in Luke and Matt). Mark also calls James and John the sons of Zebedee as well as explaining that Jesus called them Boanerges - the sons of thunder. Matt omits the nickname. Luke only gives their names. Philip, Bartholomew, Matthew and Thomas are listed next, and all three gospels use the same order. There is a slight complication however. The disciple Matthew has traditionally been associated with the first gospel (which I'll call Matt from here on to avoid confusion) and Matt describes him as a tax collector - in contrast to the other two gospels which both omit this detail. This rings a bell for Matt's readers, who have just heard a story in the previous chapter about a tax collector called Matthew who decides to follow Jesus. However, the parallel accounts call this man Levi rather than Matthew. The traditional way of resolving this is to ascribe both names to the same individual. in fact the 1977 film Jesus of Nazareth has Matthew introducing himself as "Matthew, or Levi, I'm known by both names". Simon Peter, who hates Matthew because he's a tax collector counters "And others". At first it appears reasonably difficult to argue against this position, until you realise that none of the gospels actually make this link. Matthew is very much a minor character - only described as a tax collector in Matt, and Levi appears only in the story of his calling. To switch their names without explanation would be odd indeed. Even so these are relatively minor objections without a credible alternative. Mine would be that Matt conflates the two characters, perhaps because Matthew was indeed a tax collector, and Matt saw enough in Levi's story to adopt it for his own eponymous author. Incidentally, it seems, to me, that this a reasonably strong evidence against the Greisbach theory (Matthean priority) and a good piece of evidence that the book was written by a Matthean school / disciple adopting Mark. If Matthew had written himself directly into the gospel, then it would be unusual for the other two to contradict him and write him out - he should know, after all. But someone connected to the disciple would be likely to override their source if they wanted to add a bit of colour to their mentor. Then we come to the final four - James son of Alphaeus, Thaddaeus, Simon the Cananaean and Judas Iscariot, as Mark has them. The mention of James's father gives an additional datum for the issue above, because Levi was also known as a "son of Alphaeus". As the villain of the piece Judas Iscariot is always listed last. But questions circle around the other two. The Synoptics all agree that there was another Simon, but differ as to his nickname. Mark and Matt both call him a Cananaean. Luke calls him a zealotes. It's a reasonably safe assumption that this is the same man and that Luke simply switched Cananaean for Zealot so his audience would fully understand. Both titles are possible translations of the Hebrew word qana, meaning "the zealous", though for a period it was thought Simon was from Cana the site of Jesus' first miracle. The most complicated of all is the identification of the final disciple. Mark calls him Thaddaeus. Luke/Acts opt for Judas of James. But the various ancient copies of Matthew that we have don't even agree amongst themselves. Some agree with Mark's Thaddaeus. Others have simply Lebbaeus and others use both names Lebbaios epikaleō Thaddaios which probably means Lebbaeus whose surname was Thaddeus, but might mean something else. The problem is further complicated by some preferring to use Jude rather than Judas. Quite what to make of this I don't really know, particularly given the variations in Matthew. There are three broad possibilities here. 1 - The original writer of Matthew deliberately changed Thaddeus to Lebbeus, but that later copyists moved back towards Mark's Thaddeus (whether accidentally or deliberately), perhaps using the expanded term as a halfway house. 2 - The original writer of Matthew also had Thaddeus, but that a copyist made an error and introduced a Lebbeus, perhaps because of the similar name endings. 3 - The original writer of Matthew expanded Thaddeus's name, perhaps because he had some additional information, but later copyists moved to shorter versions (one the one hand perhaps deliberately to harmonise with Mark, on the other perhaps accidentally to just Lebbeus). What's interesting about this is the process has almost moved to completion as many translators simply opt for Thaddeus for Matt, Mark, Luke and Acts. The expanded version is strange though because it only complicated things. All the other names Mark lists are first names. Why would he only give Thaddeus's surname? Luke for some reason rejects both options and goes for Judas (son/brother) of James (lit. Jacob). Some commentators maintain that this was his real name and that Thaddeus was only a nickname or a surname (presumably preferring option 2 above). It's possible that even having the same name as the traitor was considered so insulting that Mark and Matthew went for a different name. By the time Luke wrote a little later, and in a non-Jewish context, the stigma had lessened. But its also possible that Luke was thinking of a different man. Either way he seems to draw on the various other sources which he both claim to have, and demonstrably uses elsewhere. John's Gospel also mentions a Judas, stressing that this is a different man from Judas Iscariot, but more on John's account later. So the existence of one disciple who had a variety of names remains a strong possibility, but what, then are the others? Well firstly, there is the chance that some of the gospel writers simply got it wrong. Then there's the chance that one of the disciples was replaced part way through Jesus' ministry. A further option is to take seriously those scholars who claim that Judas Iscariot was a rhetorical invention. Assuming Jesus really did have 12 disciples then Judas would have to supplant one of the others. Lastly, some would hold that there never were a clearly defined group of twelve and that Mark simply invents the concept to mirror the 12 tribes of Israel. But none of these theories sit particularly easily with the various solutions to the synoptic problem. The key question is why did Luke, who was copying from at least one of the other two gospels, make the switch? Without knowing that it's difficult to really know the answer to the broader question. So what about John’s Gospel? Well somehow, I'd never really appreciated that John never lists the 12 disciples. In fact there are only two occasions when he even uses the term. The first is at the end of chapter 6 (v67-71) - Peter's confession of Christ. Here the word is used several times which is strange given that the only other time is a casual reference in the peultimate chapter of the gospel. So it's even possible that this is copied from some other source and the reference to the twelve was left in. I say this because John frequently uses the term disciples, but the likely number to which this refers seems to vary. Take the previous passage 6:60-66. 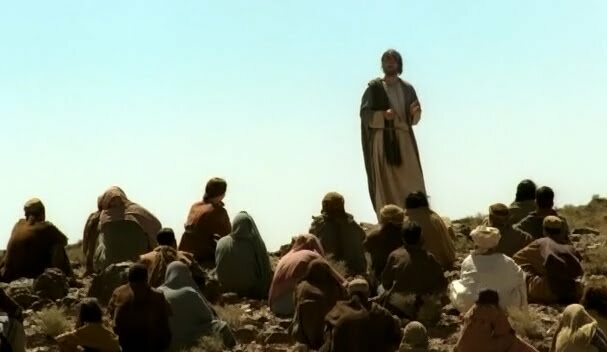 Here many of his disciples find his teaching too hard and stop following him, leaving only the twelve. The implication is that the number of disciples here is far greater than twelve. Yet "the disciples" are clearly distinct from the masses (6:2-3), are few enough to all fit on a single boat (6:16-17), and in the final chapter of the gospel (perhaps written later) the disciples number only 7 (21:1-2). It's here that we find the only list the disciples' names in the gospel. Simon Peter, Thomas called the Twin, Nathanael of Cana in Galilee, the sons of Zebedee, and two others of his disciples were together. There's a later reference to the disciple whom Jesus loved, but it's unclear whether this is one of the sons of Zebedee (as is usually assumed) or one of the two unnamed disciples. Elsewhere we find references to Judas Iscariot (whose father's name is Simon - 6:71), Peter's brother Andrew (6:8), Judas not Iscariot (14:22) and Philip (1:43). So this is a list of 9 names only one of which is entirely new, Nathanael. For some reason Nathanael is usually associated with Bartholomew, supposedly because the Synoptics list him straight afterwards while John lists Nathanael as being friends with Philip, but that seems pretty weak. But even were it to be true it still means that there's no mention of Matthew, James son of Alphaeus, or Simon the Cananaen (barring a tenuous link between Simon, a zealot, and Judas's father Simon Iscariot which a small minority maintain designates his membership of the sicarii). So all in all it doesn't look like John was particularly taken by the concept of the 12 disciples. Some would argue that he was unfamiliar with the Synoptics, though the use of "the twelve" in chapter 6 suggests he was, at least, familiar with traditions that were familiar with such a grouping. Alternatively, it's possible that he knew all too well about the Synoptics and the special twelve, but that either he actively tried to remove it, or that he simply didn't find the concept particularly useful. There's reasonable support for the later as John seems to use the term more inclusively, implying, perhaps, and invitation to become a disciple, and also refers to disciples of John and of Moses. I'm not sure what to make of all that. Feel free to chip in your ideas! I've found it helpful however to lay everything out in one go. Hope you've found it useful as well. 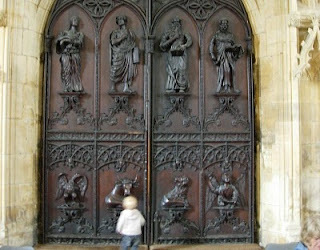 Photo taken at Beverly Minster in East Yorkshire, with Digory getting familiar with the gospel writers and their symbols. *This is what I like to call a CJism, based on the character from 70s sitcom The Fall and Rise of Reginald Perrin who, particularly in the third series joins together two phrases with great panache. His are, in general, rather better than this one. I forgot to say last week that my post Jesus in Ben Hur (2010) was my 1000th. Hope you've enjoyed them. All of a sudden it seems like quite a lot. Thanks to everyone who has commented or emailed me during that time. The "Through the Bible in Five and a Half Years" course has reached the New Testament, which is being re-branded "Rough Guide to the New Testament". Matthew is obviously up first, so I'm taking the opportunity to visit the two films that are specifically based on that gospel rather than harmonising all four. I've written about Pasolini's Il Vangelo Secondo Matteo several times over the years, but I've not written a great deal about the 1995 word for word adaptation Matthew by "Visual Bible", so I'm going to do this as I work through it. Visual Bible have claimed that their word for word adaptations were free of interpretation. "No scriptwriter's liberties. No interpretations. No dramatic license." Yet as soon as the movie starts it becomes clear that this is not the case. The opening words of the film are not from Matthew's gospel, but a prologue introducing the narrator. Many years ago when I was a young man I lived on the shores of Lake Galilee in the town of Capernaum. At that time the Roman Empire controlled all of Palestine. Although I am a Jew I worked as a tax collector for King Herod of Galilee, who paid tribute to the Roman government. My co-operation with Rome made me an outcast in my own community. However, when Jesus the Christ looked at me and said "follow me" I left everything and became one of his disciples. My name is Matthew. I am writing this gospel to show through the writings of the law, the prophets and the psalms that Jesus of Nazareth is the long awaited Messiah. The following is a word for word account of the gospel according to Matthew. Now this is a major piece of interpretation. The authorship of the first gospel is disputed. It's true that the traditional view is that it was written by the apostle of the same name, but it's also true that the text itself makes no such claim. What I like about it, however, is the way it emphasises Matthew's use of the Hebrew Bible, and his agenda in doing so. It's not unlike the final verse in John 20(v31) which states that "...these are written that you may believe that Jesus is the Messiah". Another nice touch is the way Matthew's talk of having been an outcast is contrasted with a shot of him walking along with several others (pictured above). Formerly rejected, in Christ he has found acceptance and community. That said, the execution lets it down a bit. The end product feels a little bit like a soft-focus promo shot from a 80s Christian holiday advert. We then see Matthew sit down with what I assume is his grandchild and two scribes. As it will turn out, the grandchild has already learnt parts of the gospel, such as the genealogy, yet the formal aspects at play suggest that Matthew is about to dictate the gospel for the first time. Next time I'll start at chapter 1 of the gospel, where the film's adaptation begins in earnest. I recently bought Barabbas (1961) on DVD. I was scanning through it to find a suitable screen grab to publicise the course I'm running - Rough Guide to the New Testament - and noticed a number of interesting visuals in the first few scenes alone. Some of these are obvious on a first watching - the eerie aura in the crucifixion scene due to it being filmed during an eclipse, the point of view shot as the squinting Barabbas emerges into the light, Barabbas coming face to face with Jesus in a wordless shot. But there were a number of subtler touches that I picked up this time around. The first is the way that when Barabbas first sees Jesus his head is almost 'eclipsing' the sun. This not only prefigures the celestial oddities that will occur during Jesus' crucifixion, but it also gives Jesus a halo of sorts. Then there's the way the film pairs its eponymous anti-hero, first with Pilate and then with Jesus. The relationship between Barabbas and Jesus, particularly the concept of Jesus dying in Barabbas' place is on of the film's major themes. It's emphasised in two different visual ways in the first 12 minutes. Initially the film intercuts between Barabbas' pardon and Jesus being scourged and taken to be crucified. But then, as Barabbas returns to his friends, they act out a mock coronation (top picture). This obviously corresponds to the shots of Jesus being mocked with the crown of thorns such as these: But the film also pairs Barabbas off with Pilate: The shot of Pilate washing his hands (below)of the charge against Jesus is immediately followed by one of Barabbas washing his own hands (further below). Barabbas may be about to be substituted for Jesus, but he has as much in common with Pilate, the common soldier who takes other people's death's trivially, than he does with Jesus. As an aside, the opening shot of this film (below) is a great one, positioning the viewer as if they are in the crowd (which is routing for Barabbas), thus enabling us to associate with Barabbas, and reminding us that we too are complicit in his death. As I mentioned in yesterday's review of Ben Hur, the 2010 version gives much more attention to Jesus' words than the famous 1959 version. I wanted to explore this a bit more fully than seemed appropriate in the review, so I decided to turn it into a separate post. We’ve heard it said "an eye for an eye, a tooth for a tooth". I say to you, do not fight those that wish to harm you. If someone hits your left cheek, offer them the right. If they ask for your tunic, give them your cloak as well. If they say walk this mile with me walk two miles. (Matt 5:38-42). As you’ve heard it said, "you should love your neighbour and hate your enemy". But I say to you "love your enemies, and bless those who curse you". (Matt 5:43-44). The camera then follows Judah Ben Hur into the city, and then it cuts to Esther who has returned from the sermon. She now live with Judah's former employee David, who mocks Jesus' seemingly-well-known teaching. David - "Blessed are the weak. The poor shall inherit the earth." This final exchange obviously isn't Jesus talking himself, and includes a deliberate mis-quote, but its inclusion is also important. Going back to the earlier quote from David Wyler this is a great example of "spirituality...[but not] relating it to a specific religion": if you want to see God, all you must do is be pure in heart. Thus it's when Judah lays aside his revenge, forgives Messala and is reconciled to Esther that he sees God as portrayed by the white flash of light. And it's that same flash of light, not a miracle directly related to the cross, which heals his mother and sister. The misquote is also interesting because it's an English pun, based on an assumed similarity between meekness and weakness. I'm not sure it would have worked in Aramaic. The words that we actually hear Jesus speak obviously have a very direct bearing on the major themes of the film, revenge and forgiveness. This is also reflected in the phrase we hear Jesus say twice - "Forgive them for they don't know what they are doing". This occurs once at the start of the film (as Judah looks like he is about to be crucified) and once at the end (as Jesus is about to be crucified). It's taken from Luke 23:34, but, significantly, it drops the word Father from the start. The film is not about our need to be forgiven by God, but about the importance of us forgiving one another. Having this phrase repeated does raise the question of what would have happened if Judah had heeded Jesus' advice first time around. Certainly most of his troubles would have remained, and perhaps Messala would still be alive, but it's also possible, as the 1959 version suggests more strongly, that without his drive for revenge he may never have been reunited with his mother, sister and wife. It's been over 50 years since William Wyler's version of Ben Hur galloped to a record-breaking 11 Oscars and earned itself a special place in our affections. Whilst Lew Wallace's novel had been translated into various other art forms (an arena play, a cartoon, a video game and a theme park among them), no-one had dared to remake it for all this time. But given filmmakers' current obsession with recycling old material, and the half century that has passed since our most successful film a consortium of TV channels decided it was time to dust off this particular chariot and take it out for another spin. Given the accolades poured on the original, it's no surprise that this version does not quite keep shoulder to shoulder with Charlton Heston, nibbling away at his wheels with is hub caps. That said, and against all expectations, the new version is a surprisingly competent effort. Whilst there's the occasional nod to Wyler's film, the 2010 version is content to do it's own thing and at time this works really effectively. Take, for example, the famous chariot scene. Wyler's version, with it's enormous amphitheatre packed to the rafters with an ecstatic crowd, may have been referenced by productions as diverse as The Simpsons and The Phantom Menace, but is pure fantasy from a historical point of view. Here the venue is far less impressive - it's more open plan so that the crowd is far smaller and just stand nervously around the edge of the track - but it feels more realistic. Interestingly it's more reminiscent of the pod race in The Phantom Menace than Wyler's version, which both films draw on. In contrast to the other versions of the film, the story starts with Judah Ben Hur and a Harry Potter-esque Messala racing carts as teenagers. Messala is the illegitimate son of a Roman senator who has lived with the Ben Hurs since the death of his mother. We're introduced to a stick catching game which predictably reappears throughout the film - the adult Ben Hur always catches it, whereas the adult Messala always drops it, accompanied by a slow-motion shot of it thudding onto the ground. But suddenly Messala's father calls him to Rome, leaving both boys devastated. Cut to eight years later and Messala's father has arranged for his son to be given the garrison commander position in Jerusalem. Judah now looks like a cross between Charlton Heston and Robert Webb and runs his dead father's business, trying to toe a fine line between the Jewish zealots that work for him and the Romans he relies on to keep his business going. It feels like some kind of metaphor Tony Blair's third way politics, but I doubt that's what the filmmakers had in mind. Messala's first official task is to arrange Pontius Pilate's entry into the city. He fails to get Judah to inform on his zealot colleague, but nevertheless takes the governor on a more circuitous route through the city, rather than smuggle him in through the back door. Pilate is quickly shown to be incompetent and melodramatic. We first see him struggling to get onto his horse, and then when the tile slips from Judah's roof he scrabbles around feebly rather than brushing it off like a soldier. Pilate is incensed. Messala disgraced. Judah arrested. Pilate sends Judah to be crucified, and on his way to the cross a stranger tells him "forgive them, for they know not what they do". It soon turns out however that Messala has disobeyed his commander and deferred Judah's sentence to life as galley slave. The ship Judah rows on is owned by prominent Roman Quintus Arrius (Ray Winstone) who is impressed at Judah's suggestion to make the ship more efficient. On a whim, Quintus unchains Judah one evening so that when the ship is sunk a few hours later Judah is able to rescue him. The two return to Rome where Quintus locks horns with Messala's father, Senator Marcellus Agrippa, for the attention of Emperor Tiberius (Ben Cross), who already thinks himself divine. When Quintus credits his survival to "the will of the gods", Tiberius smirks. "We do amuse ourselves in a most peculiar fashion". Whilst Marcellus is manoeuvring to get Pilate replaced by his son Messala, Quintus is setting things up for Judah. He orders Judah to sleep with Marcellus' slave Athene, gets him pardoned and freed, makes him his heir and then promptly and conveniently dies leaving Judah as a very rich man. All of which suggests that this version of Ben Hur draws on Gladiator and the TV series Rome as much as the William Wyler classic. Part two starts back in Judea with Esther, who had previously been betrothed to Judah, listening to Jesus (Julian Casey) preach. His talk is taking place on a small hill, but the excerpts we hear leave no doubt that this is meant to be the Sermon on the Mount.1 Meanwhile, Judah has returned to Rome seeking revenge on Messala, meeting Pontius Pilate and buying back his old house. Judah's first conversation with Pilate is significant not only because it mentions the local chariot race, but also because of a supposedly off the cuff mention of a Jewish trouble maker. I've never actually read Wallace's novel, though a copy sits in a box at home somewhere, so I shan't go into too great a detail as to which parts of the book have been omitted. One aspect that was missing however was the presence, or lack of, of Balthasar, one of the magi who visited Jesus after he was born. In the book Balthasar befriends Judah, and it is he who is Judah's doorway to Jesus. But in this version not only is the nativity scene at the start of the film omitted (perhaps because it was so well satirised in Life of Brian, but also Balthasar's presence later on. Indeed much of the later part of the book is abbreviated. 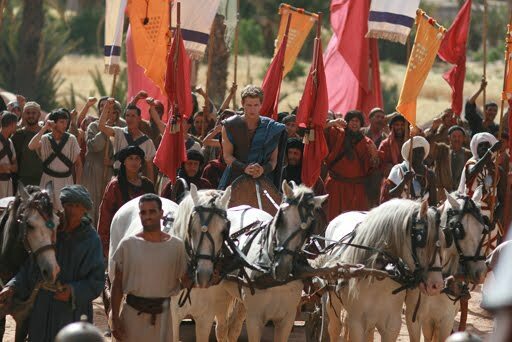 Judah buys back his old house, is gradually reunited with his former acquaintances and wins the aforementioned chariot race, with Messala dying from injuries sustained in the race. There's a sub-plot with one of Judah's former employees attempting to marry Esther, and Judah carries on with Athene. He witnesses Jesus' triumphal entry and subsequent crucifixion, is converted and reunited with his mother and sister and is reunited with Esther. Nevertheless, given all that has gone before everything gets resolved in an overly cheery manner that feels out of step with the rest of the film. The latter stages of the story are, of course where the narrative focuses in on Jesus and his teaching. I remember back in 2008 hearing producer David Wyler saying both that they wanted "to look at the spirituality within the piece rather than directly relating it to a specific religion" and that it would be based more on the original novel. That seemed like something of a contradiction, but this is actually a fair assessment. In many ways this version of the story has more focus on Jesus than any of the three previous film versions. Rather than Jesus simply passing Judah some water, he instead urges forgiveness. The start of episode two gives a good deal of the heart of Jesus' teaching. This teaching clearly influences Esther and she quotes Jesus several times, again specifically with regard to forgiveness. Then there's a discussion between Pilate and his aide about Jesus' trial. (It's unfortunate that the blame is placed on the Jewish authorities, rather than the Romans, but then I suppose that Pilate might wish to blame someone else). Judah's meeting with Jesus on the road to the cross remains, and, as in 1959, echoes their earlier meeting. But Jesus' admonishment to "forgive them" has a double meaning. It's not just about the soldiers that are crucifying him, but about Judah's attitude to Messala. But the scenes with Jesus on the cross - so critical in the 1959 film - are reduced to a shot of the cross a long way in the distance. And whereas that version saw Judah's mother and sister being healed during, and by implication because of, Jesus' crucifixion, this version can certainly be taken as suggesting the miracle happened some time later, and was perhaps at least as much to do with the reconciliation between Judah and his childhood friend. So whereas earlier takes on the story had their focus on Jesus, the focus here is more on a critical part of his teaching. The emphasis is primarily on the power of forgiveness itself, rather than the power of the cross. In other words, Wyler was right, Ben Hur (2010) is about forgiveness (the spirituality), rather than about the one in whom, (according to Christianity - a specific religion) forgiveness finds its greatest expression. 1959 closing shot was of tree crosses on a hill: 2010 zoomed out from a close up of the fully reconciled Judah and Esther across a busy marketplace. That shouldn't be taken as a criticism necessarily. Indeed given the differences between the audiences of the two films, this later version is, in many ways far bolder. There are however a few moments where the script lets things down. Firstly, and perhaps as should be expected for a Roman-Christian Epic, the dialogue is often overwrought. When Judah sleeps with Athene for the first time she purrs "I did not expect to get virginity along with virility". It's not helped by actress Lucía Jiménez delivering this and other lines as if she's saying "Monsieur! With these Ferrero Rocher's you are really spoiling us". That said there are also some some very clever double meanings, such as when Quintus, unaware that Athene has just poisoned him, says he will be "leaving this accursed place, so, make haste". Secondly, there's a handful of lazy shortcuts, which would seem unlikely in real life. Why for example, does Ben Hur leave it so late to ask anyone about the fate of his mother and sister. And why does he leave his friend to die with his foot chained to the sinking galley rather than just cut it off? Is it likely that Quintus would be completely unaware of the Hur family given that his son lived with them? We find out that Pilate's regime is more compassionate than even the gospels allow. When Simonides is crucified the day before the Sabbath (a weekly occurrence) he is not enabled to die quickly by having his legs broken, but taken down and allowed to live (albeit with a disability). Likewise, Pilate doesn't just release one prisoner for the Passover, but all of them. The one thing that mitigates all this is that the plot is well paced, the story is engaging and the film is gripping - even though its outcome is known in advance. There's a chance that Ben Hur might be better than I expected purely because my expectations were so low. Certainly it doesn't match either the 1925 or the 1959 film adaptations. Nevertheless it's entertaining, contains some meaningful shots and whilst its focus on forgiveness may differ from previous adaptations, it's more effective at conveying the freedom that forgiveness can bring. 1 - I may detail these later, but I made these notes - 70 x 7, eye for an eye, turn the other cheek, tunic/cloak, walk 2 miles, love your enemies, beatitudes.